If the Source of Becoming Informed, and of Knowing - Lies in How Much CHARGE Information can Be Contained or Embedded in the Body..
Then The Goal of EDUCATION Should be that Peak..
Study in Russia Indicates Fractal Golden Ratio Harmonics in BrainWaves as Mechanism of Euphoria / Active Visualization / Bliss? May Support Neurofeedback Solutions to ATTENTION DISORDERS Based on IMPLOSION. Study in Russia (Konstantin Korotkov, Gas Discharge Visualization Group) http://www.heartbeat2000.com/korotkov.htm , kindly reprinted by James Barrett (HeartLink Project), heartbeat2000.com , shows that Bliss / Euphoria - active visualization states, measureably correspond to Golden Mean Fractal Ratio between EEG contained harmonics. Above: Dr Korotkov- shows by GDV measurement that the altered state / bliss / euphoria which accompanies increased perception - has consistent qualities. The GDV area (aura size) should correlate to increased heart coherence. 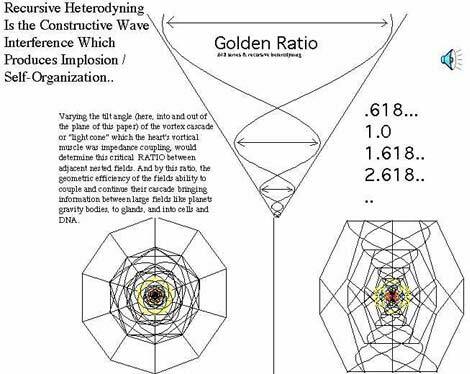 This begins to confirm Dan Winter's model of attention as an charge implosion self-organized in the wave symmetry of Golden Ratio / PHI / Self-Similarity.. When this key signature reaches 1 / the .618 Golden Ratio (red line above) is correlated extensively by thousands of users to the moment of openness/wonder/love/compassion in EKG. also... Restoring those harmonics in neurofeedback appears to be clinically documentable solution to ADDICTION and ATTENTION DEFICIT DISODER (the self-empowering BLISS solution ). And this confirms why so many peoples HEART's choose a GOLDEN MEAN Ratio (the original BRAINFIRE article) when they feel Harmonically Inclusive (Compassion). James Barret: "(This) is a study done that happens to supports our contentions of fractality." ANALYSIS WITH COMPLEX BIOELECTROGRAPHIC APPROACH. (Relevant Exerpts Reprinted below, complete article at link above). It is noteworthy, that during active imagination in ASC-2 the EEG power spectrum profile both of anticentral and retrocentral zones statistically followed the function l/f. The attracter of spectrum subdominant frequencies (delta, teta, alpha and beta-1) was the ratio 1,61± 10% (fig.1, table 1). This ratio is well known in literature as "golden section". It should be noted, that a similar structure of EEG spectrum was discovered earlier during modelling a positive mental state , and fractal l/f fluctuations in EEG spectrum were considered as the reflection of the general mechanism of biological integration of functional cortex systems and their harmonization [12, 16]. The above-mentioned, as well as the fact that EEG spectrum in ASC-2 was characterised by the polyharmony of frequency components allowed assumption on the possible increase of "harmonic resonance" during energy-informational activity . 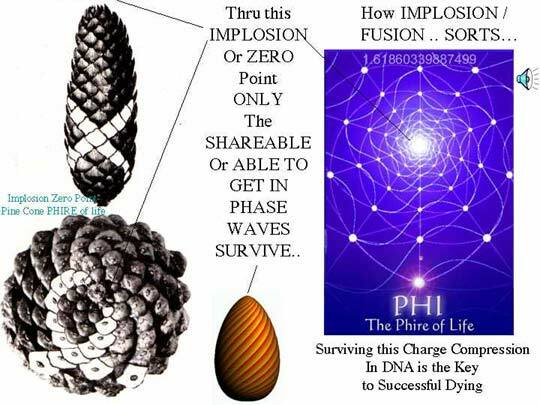 (Insert note her added by Dan Winter - POLYHARMONY OF FREQUENCY COMPONENTS PROBABLY MEANS THAT MAXIMUM HARMONIC INCLUSIVENESS IS MADE POSSIBLE BY PHI / GOLDEN RATIO -TUNING GEOMETRY : 'PHIlotaxis'... Compare to IRVING DARDIK on FRACTAL HARMONIC INCLUSIVENESS in Heart Rate Variability statistically predicted reduced disease and aging). All the above mentioned and published data allowed assertion that the consciousness transformation into ASC was connected with the system reorganization of the brain activity. (Insert Note added by Dan Winter : Systems ReOrganization suggests SELF-ORGANIZATION by Fractal Self Similarity causing Self-Reference / Self-Awareness? ). ....... With this, the fact that the patients described their mental state in ASC-2 not only as the state of positive psycho-energy activation but also as the state of "inner euphoria" allowed assumption that in ASC activation of "self - rewarding" brain systems took place . The later is more fair as the phencyclidine brain receptors belong to the systems of positive self-maintenance of the brain . At the same time, the discovered EEG spectrum characteristics specific for ASC, in particular changes of EEG fractal components, allowed supposition that the energy-informational interaction in these terms is not limited by the brain substrate. We can refer to energy-informational inter-relations on the level of transpersonal multilevel subconscious perception [26, 27]. Starting with the Ecstatic Brain-Lit by the Breath.. Many Health and Behavior Disorders? This is from Dardiks cycles paper(link below). What does Lo HRV mean? and what is its signature? Optium look looks like what? the same. The more even (metronome-like) the frequency changes, the lower the HRV.Conversely, the more uneven the frequency changes, the greater the HRV. this is Dardik explaination, sustained , even spacings, like ones at phi they are saying is bad. or am i wrong.?? The more even metronome like the lower the HRV and that's bad? 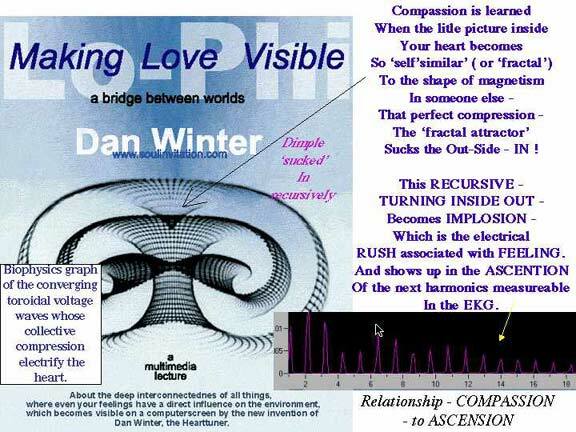 frequency harmonics.. that is the AMA's notion of health..
we have a new geometric definition of what cascade in the HRV OPTIMIZES max harmonic inclusiveness which is the LIMIT OR PERFECT CONDITION OF MAX VARIABILITY. a cascade based on embedding optimized.. even at that long wave level.. This is similar to what we have learned about the harmonic content of the "Schumann Resonance", long wave background magnetic of the planet. Working with Prof. Phil Callahan, we conclude that health for the planet is the completion of an EMBEDDED SERIES of harmonics, and NOT a single simple sine wave. This is also true of the change from addiction to health, when the EEG neurofeedback learns to complete a wholesome cascade, emerging from a rut which requires alchohol to replace the missing alpha. The news here is that now knowing the harmonic geometry of perfecting embedding or nesting, we can teach all these oscillators INCLUDING HRV to survive, literally as a sustainable wave. When Dr. Irving Dardik M.D. originally published that getting more waves superposed in the Heart The Origin of Disease and Health Heart Waves The Single Solution to Heart Rate Variability my insight was to solve the mathematics for what permitted heart harmonics to be, as he so well said, "a wave within a wave waving" nondestructive to each other. What I determined was that a cascade of harmonics, related to each other by the Golden Mean or PHI, would PERFECT this nesting. (To QUANTIFY EMBEDABILITIY). The Heart Spectrum Analysis (2nd order power spectra to prove this and make it teachable. Now a possible answer to WHY this HeartHarmonic Content shows up first as a cascade then as a flatline in HRV, becomes measureable since we have HRV dynamically refreshed on the Heart Biofeedback. This paper hypothesizes a new meaning to HRV when it goes from heart harmonics which the A.M.A. considers HEALTHY, to when the HRV goes flat line, which is often when the Heart Harmonics (which the HeartLink monitor measures) become VERY INTERNALLY COHERENT. This situation of extreme heart coherence is OFTEN correlate to deep meditation. Yet frequently (as at http://www.webcom.com/hrtmath/IHM/ResearchPapers/TowardCardiac/Figure2.html mentioned below), this INTERNAL HEART COHERENCE (taught by HeartLink), correlates to a FLAT LINE Heart Rate Variability (HRV). So I posed the interesting question to Rollin McCraty at Heart Math Institute, why does long years of meditation produce a HRV wave which the AMA might say is unhealthy? This paper is an attempt to answer that question, and propose a new meaning to harmonic cascades in the Heart Harmonics AND the HRV. note carefully in this picture might suggest that HEALTHY (/or ENTRAINED?) HeartRateVariability appears to be just ONE PEAK near .1 HZ. And it is true that frequently as we approach ecstacy our breath does GRADUALLY GO TO ZERO! in particular what happens in the classic breathing pattern toward the still point is the geometry of "perfect damping" or approach to stillness from radio theory. In this breathing, each succeeding breath starting from a large one is .618 AS DEEP AND AS LONG AS THE PRECEDING BREATH. In this way a perfect graduated breathing leads to a VERY REFINED BREATH, which accesses contiguously shorter and shorter wave harmonics electrically in the body. As in the picture below from the above article.. This amounts to a 3D rotating caddeuceus below, which creates the IN-PHI-KNIT embedding we have described as the origin of the holy grail. So originally, it was suggested that internal coherence (which is what the HeartLink teaches) has NO peaks (flatlined) HRV. That is why Rollin McCraty at HeartMath, mused to us about whether meditation does in fact serve the heart.. I suggest what may be ideal is a CASCADE of ORDERED peaks in the hrv WHICH ARE IN PHASE with simultaneous ORDERED PEAKS in the heart power spectra. This produces also high COHERENCE peak in the second order power spectra used in HEARTLINK. The point being that often people gradually almost stop breathing to enter the internal coherence state (high peak in COHERENCE in HeartLink). In itself this of course does by reduced oxygen consumtion in the brain, increase electrical conductivity there. This is also why people consume alchohol to imitate ecstacy by reduced Oxygen in the brain).. HOWEVER.. this breath damping by spin path to zero point may become sustainable ONLY when it is replaced a sonic phonon cascade cohering Heart ("igniting" the brain). There is only one sonic geometry: the PHI ray caddeuceus (which is also breathing to a ZERO POINT) which becomes sustainable (otherwise a flatlined HRV = body decay per A.M.A.). So the HRV first coheres, THEN cascades, THEN goes to stillness, in that necessary ordered literally in-"spired", breathed from long to short wave. The zero breath for ecstatic state requires brain to inhabit an alternate (longer phonon sonic wave instead of ionic covalent oxidative) charge envelope for survival. This is because it is not inherently OXIDATION that produces mindfulness, only the recursive phase lock charge cascade which that propagates. 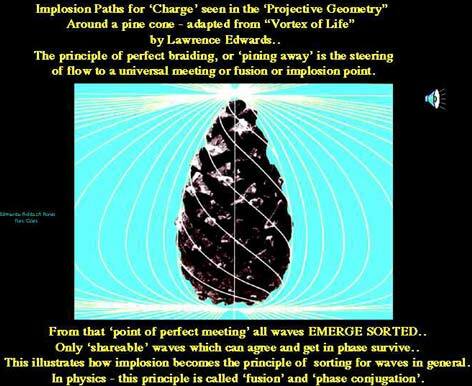 which enables "presence of mind"
which is simply the inPHIknit multiple connectivity of charge waves allowing greatest response-ability among them.. Prepare the field, and presence comes. with a longer wave phonon (glandular ecstatic sonics) based recursive charge field.. The longer wave penetrating capacitance of this glandular sonic braided instead of oxidation based charge field has the resolving power to sort wave phases at a distance, we call "cosmic consciousness" (book by Bucke, MD) or enlightenment.. Note that in the language of entering into the discipline of HIGHER DIMENSION, which is superposing more spins nonDESTRUCTIVELY (which requires PHI ratio), we may have the perfect tool in the cascading of frequency signature UPON itself, multiple times.. (pioneered by HeartLink).